The school board in the coming months will be tasked with hiring a replacement for the departing Dr. Jim Hinson. As we do each election cycle, we’ve taken (ample) reader input and developed a five-item questionnaire for the candidates who will be on the ballot in the Shawnee Mission Board of Education primaries this August. SM West area representative: Lee Biard*, Craig Denny (incumbent), Laura Guy and Chris White. Each candidate will have the opportunity to submit a 400 word response to each item. We’ll publish the responses to one question per day for five days starting Monday, July 10. (Note that we are also hosting in-person candidate forums for the at-large candidates on Saturday, July 15, and for the SM West area candidates on Saturday, July 22. SAVE THE DATES!). 1.) 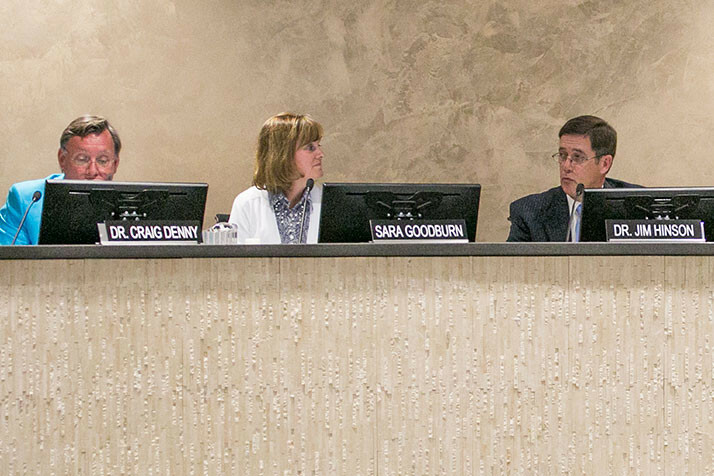 For years, the school board’s actions have been marked by little public discussion and almost entirely unanimous votes. Do you view this conformity among school board members as being positive or negative for the district? Why? 2.) Members of the school board will be charged with selecting a new superintendent in the coming months. What is the biggest challenge facing the district today, and what qualities will a new superintendent need to address it? 3.) What does the Shawnee Mission School District need to do to attract, support and retain quality teachers? Do you view the district today as an attractive place for teachers to make a career? 4.) In 2014, the district launched its “one-to-one” technology initiative, investing tens of millions to provide every student with his or her own Apple MacBook or iPad. Since the roll out, some teachers have expressed concern about lack of training opportunities on integrating the devices into lesson plans. Some parents have complained that their kids are spending a good deal of time of the devices for non-classroom activities. Do you think the one-to-one initiative has been a success? Why or why not? Does anything with the program need to change? 5.) If you are elected to the school board, what will your top priorities be? *Biard filed just ahead of the deadline this month, but has indicated that he no longer plans to actively campaign for the position, and that he will support Chris White in the election.